Custom Craftworks is passionate about helping schools and students by subsidizing classroom equipment. We believe students deserve to learn the art of massage utilizing high quality tables, chairs and accessories. Learn more about our Advocate Program, School Distributor Program, Tables with Tuition and School Property programs below. Custom Craftwork's Advocate Program makes it easy for educators to offer students a generous discount on tables and supplies as well as consultative services. We’ll give you brochures to pass out to your students along with a unique discount code. Interested students can visit customcraftworks.com 24/7 to use their code or call us directly. Our trained staff consults with them to choose the right equipment for their needs. We invoice your student. They can pay us by debit/credit card or mail in a check. We will ship directly to your student. The student receives a discount on all products ordered. Advocate Schools are entitled to all of the sales support and programs we offer. Does this sound like the program for your school? If so, please contact our customer service specialists and they will gladly help you get started or answer any questions you may have. Tables with Tuition is an innovative program that is both easy to implement and rewarding. 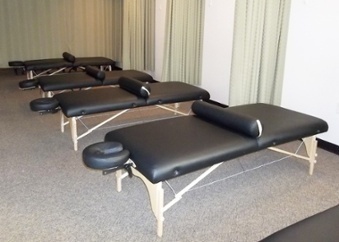 During enrollment for students, Custom Craftworks will provide a high quality Custom Craftworks massage table and/or massage chair package as a part of the program which will enhance the value of your program. Your school simply has to designate the times during the school year preferred to order equipment. We will design a program that best fits the time constraints of your faculty. You may standardize the color you select for your school, or allow student choices. You can call, e-mail or fax the orders in. We provide an easy order form with all of your information. No searching for account numbers etc., just provide a P.O. (If required) and number of packages. We will take care of the rest! Once the tables ship, you will receive a tracking number so you can prepare your students, and your space, for the arrival of equipment. As you can see, along with competitive pricing, support from your vendor is extremely important. Our customer service team has often been called the best in the industry. We invite you to contact us and put us to the test. With our School Distributor Program, you can feel confident you are offering quality equipment to your students right on campus. You can choose to place group orders for students or sell through your bookstore. Educate your students about proper massage therapy equipment and what can be purchased through the school. You can organize a table day using our “Table Talk” guideline or any curriculum you choose. We are happy to provide staff training on our products. You may standardize the school package to fit your needs best, or allow student choices. The school pays for the equipment ordered and collects payment from the student. 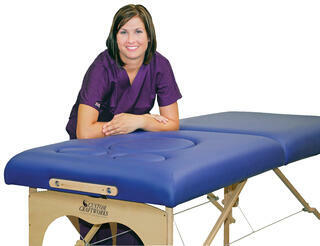 Our School Property Program provides special pricing on Custom Craftworks equipment for massage schools. With this program, we wish to demonstrate our commitment to the educational mission. We think you will appreciate having access to the longest lasting and best performing equipment available at a substantially reduced cost. Price and service are not all we have to offer you at Custom Craftworks. Our tables have an excellent reputation for being among the highest quality tables in the industry. This ongoing commitment to quality is reflected in every choice we make, from material selection to execution of the final product. Our massage tables and chairs are a choice that you and your students will feel good about. Mike Ernesti, President Greentreet Services, inc.